30 Bays Building, Sector-17, Chandigarh. Welder-35 Posts for Degree/Diploma Holder and 20 Posts for ITI/CTI. Plumber-28 Posts for Degree/Diploma Holder and 13 Posts for ITI/CTI. Turner-39 Posts for Degree/Diploma Holder and 17 Posts for ITI/CTI. Fitter-37 Posts for Degree/Diploma Holder and 21 Posts for ITI/CTI. 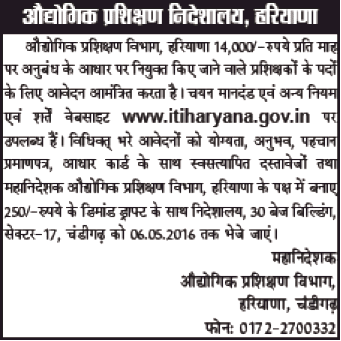 Electrician-48 Posts for Degree/Diploma Holder and 36 Posts for ITI/CTI. Carpenter-14 Posts for Degree/Diploma Holder and 06 Posts for ITI/CTI.Motor Mechanic-16 Posts for Degree/Diploma Holder and 04 Posts for ITI/CTI. Mechanic Diesel-10 Posts for Degree/Diploma Holder and 11 Posts for ITI/CTI. Machinist-23 Posts for Degree/Diploma Holder and 13 Posts for ITI/CTI. Tool & Die-02 Posts for Degree/Diploma Holder and 01 Post for ITI/CTI. Machinist Grinder-03 Posts for Degree/Diploma Holder and 02 Posts for ITI/CTI. DMC-26 Posts for Degree/Diploma Holder and 22 Posts for ITI/CTI. DMM-13 Posts for Degree/Diploma Holder and 14 Posts for ITI/CTI. Sheet Metal-01 Post for Degree/Diploma Holder. MMTM Millwright-04 Posts for Degree/Diploma Holder and 02 Posts for ITI/CTI. Electronics Meach.-15 Posts for Degree/Diploma Holder and 09 Posts for ITI/CTI. Wireman-13 Posts for Degree/Diploma Holder and 14 Posts for ITI/CTI. Mechanic Consumer Electronics-03 Posts for Degree/Diploma Holder and 04 Posts for ITI/CTI. R & AC-16 Posts for Degree/Diploma Holder and 08 Posts for ITI/CTI. Forger & Heat Treatment-01 Posts for Degree/Diploma Holder. Severer-02 Posts for Degree/Diploma Holder. Molder-02 Posts for Degree/Diploma Holder and 01 Posts for ITI/CTI. Instrument Mechanic-05 Posts for Degree/Diploma Holder and 07 Posts for ITI/CTI. Electroplater-01 Post for Degree/Diploma Holder. ITESM-02 Posts for Degree/Diploma Holder. Painter General-14 Posts for Degree/Diploma Holder and 10 Posts for ITI/CTI. Tractor Mechanic-09 Posts for Degree/Diploma Holder and 02 Posts for ITI/CTI. Architectural Assistant-03 Posts for Degree/Diploma Holder. Computer Hardware & Network-08 Posts for Degree/Diploma Holder and 03 Posts for ITI/CTI. Workshop Calculation & Science-58 Posts for Degree/Diploma Holder. Steno Hindi-18 Posts for Degree/Diploma Holder and 04 Posts for ITI/CTI. Steno English-20 Posts for Degree/Diploma Holder and 05 Posts for ITI/CTI. Book Binder-02 Posts for Degree/Diploma Holder and 01 Post for ITI/CTI. Dress Making-10 Posts for Degree/Diploma Holder and 04 Posts for ITI/CTI. Embroidery & Needle Work-06 Posts for Degree/Diploma Holder and 05 Posts for ITI/CTI. Computer-38 Posts for Degree/Diploma Holder. COPA-46 Posts for Degree/Diploma Holder. Engineering Drawing-64 Posts for Degree Holder.